From the grooves of Nirvana and the Beatles, to gear setup and gain stacking, this Bundle delivers true knowledge for every electric guitar player. Complete with 65 video lessons and 20 JamTracks, we tackle the most common hurdles for any guitar player. This Bundle also puts you in the driver seat, providing you with stems and guide tracks to begin crafting your own music and sound. View other bundles or start checkout and get it free! 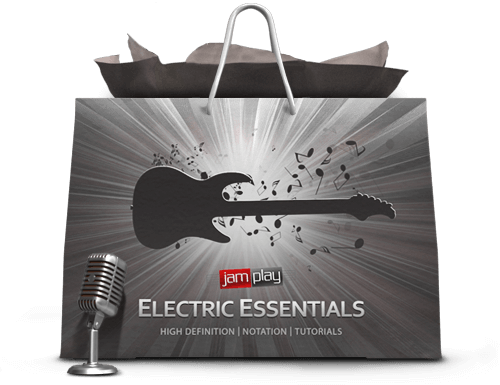 65 electric lessons in 4 seperate packs, including a JamTrack Pack. Exclusive "Electric Starter" JamTrack Pack included in this Bundle. All lessons are filmed in 4k with 7 cameras and delivered in 1080p. Fill gaps in your playing and improve your understanding of core topics. All tabs and notation included in PDF and Guitar Pro formats. One of our most impressive packs of the Holiday Season... take your power chords from 0 to 100 with twenty custom riffs. Chris Liepe composes 4 custom songs to have you practicing real music, all while expanding your arsenal of power chord vocabulary. Full song backing tracks are included, along with looper tracks for individual riff practice. Delivered in 1080p with full tabs, Guitar Pro files, stems, and Master PDF. 20 riffs across four different tracks that will not only give you a work out, but will have you riffing in the context of real song form. It's one thing to pull random riffs out of the sky and say "Here learn these". It's an entirely different level of immersion when you get to practice dialing in the perfect sound, commit a riff to memory and practice connecting different riffs musically. Play along with Power Punk, 90s Alternative Metal, Progressive Rock and Mid 2000s hard rock as you explore the many ways power chords are used to melt faces. To have fun while learning power chord riffs, and practice over backing tracks while improving technique and timing. Learn 20 unmistakable and catchy rhythm guitar parts coverings sounds from the last fifty years! Chris Liepe delivers an essential collection of grooves and sounds across many of guitar’s most popular genres, including the sounds of John Mellencamp, The Beatles, Nirvana, Lenny Kravitz, Montrose and more. Of course, backing tracks, tabs and stems are all included.. enabling you to make music on your own. Improve your timing and rhythm guitar chops, as well as dialing in guitar tones to hone in on specific rhythm playing techniques. Each rhythm has its own backing track and a guide track so you can focus becoming just the right rhythm player for each occasion. You might come away from this pack with a bit of nostalgia, and you’ll definitely be a well-rounded student of rhythm guitar after working your way through all of this music! Improve your rhythm guitar playing, timing, and "locking in" to the beat with 20 rhythm riffs and grooves. Emulate the groove of Nirvana, The Beatles and more. Is my guitar setup correctly? Which amp should I choose and what effects should I be using? Get answers to these questions and more in this pack targeted at the gear novices of the world. Don’t leave anything to guess work. Get started on the right path with the right gear and make learning and practicing easy on yourself. This pack includes 15 videos covering everything from simple guitar setup and changing strings to basic amp setup and gain stacking. The goal of this course is to save you time and headaches, as well as sound like a better guitar player. The guitar is a finnicky instrument, and an amplifier is a bit of an untamed bear. Chris Liepe offers you 20 years of studio experience to tackle these issues, allowing you maximize your equipment. To better understand, and utilize the gear you have. To tame your amp and create refined, purpose-drive guitar tone. Control Gain stacking and overdrive pedals. This simple guide and lesson set is designed to provide the beginner guitarist with the essential knowledge needed to interpret music written in guitar tablature form. We will introduce you to tab layout, and slowly introduce the most common markings and articulations needed to extract the "essence" out of a piece of music. Eventually, we will also move to sight reading simple lines and rhythms. 10 lessons in 1080p with full documentation and PDF guide. Maybe you "know" how to read tabs.. but you may ignore some markings and articulations. The course is designed to both "get you up to speed" with tabs, as well as fill any gaps in your knowledge. Most people tend to "figure it out on their own" when first playing guitar, but understanding tabs is critical to make pratice and playing more effecient. 10 lessons in 1080p with full guide book, introducing tablature and eventually leading to sight reading and rhythms. If you’re just starting out on your guitar journey, sometimes it can be challenging to know what genres you’re interested in learning. We all have things that we know and love, but it can be both fun and rewarding to discover and learn a genre we’re not familiar with. If this sounds like you, this is a great pack to start with. Play along with 20 unique tracks across a diverse range of styles, featuring pro session musicians and easy-to-follow lead charts. Each track includes a helpful Guide Track MP3 with narration covering important points to practice. These tracks are specifically geared towards beginning players, incorporating simple rhythms and easy chord progressions. Once you find a track (or tracks) that you like, simply listen to the Guide Track and it will refer you to other JamTrack Packs that you might enjoy. Select the Electric Essentials at checkout and get it for free. Own it for life. Limited Time only.